View More In Back Packs. The Secure Wheelchair Backpack is the perfect wheelchair accessory for keeping everyday essentials close-at-hand. Adjustable attachment straps with quick release buckles loop over the back handles of almost any wheelchair making installation and removal effortless. Durable water-resistant nylon fabric backpack features a spacious main compartment with zippered closure and two front zippered pockets. Features a mesh side pouch that is a perfect fit for all Secure fall management alarm monitors, beverage bottles, etc. Reflector strip sewn onto the back of the wheelchair provides additional safety during nighttime use. Dimensions: 13" x 12.5" x 3". One year warranty against defects and workmanship. 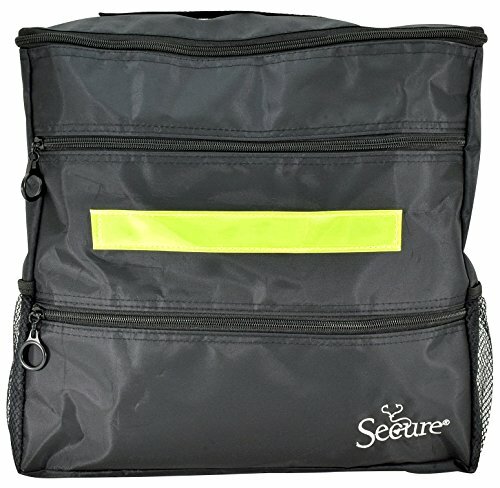 Features a mesh side pouch that is a perfect fit for all Secure fall management alarm monitors, beverage bottles, etc.